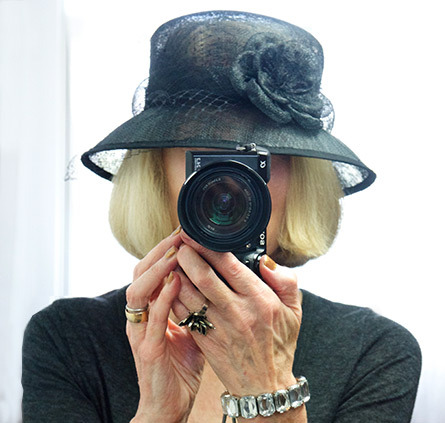 And a big thank you to Tricia Cusden of Look Fabulous Forever, who happened to feature me in her latest post (Your Signature Style) which meant I had lots of visitors on Sunday – hi and welcome! As you all know I love a bargain. I started the blog because my pension just didn’t stretch to paying the full price for the stylish clothes that I loved – but hey charity shops in the UK really do have quality clothes for all ages, shapes and purses! But I’m also very militantly against any ageism in society, and especially any advice given by much younger journalists on what older women should and should not wear (and that includes makeup, as well). As far as I’m concerned there is no such thing as age inappropriate clothing because, if you think about it, people of all ages make mistakes about style. 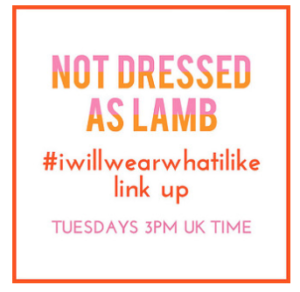 However, as a blogger, I don’t like to accentuate the negative and go on about ‘mistakes’, personally I think, let’s accentuate the positive, and wear what we jolly well like! Mind you, I’ve recently bought two dresses and in both instances I felt, ‘should I’? The thing is both of them made me laugh when I put them on. This one was £5.00 from the Cats Protection League in Brighton. Really I shouldn’t have. And if I scrutinise the shape it is a bit top heavy. But it’s fun and astonishingly comfortable. As is this Zara dress, which I think I kind of prefer. It’s a bit of a skater’s outfit and I’ll probably wear it over thicker leggings or a pair of skinny black trousers/pants. This cost just under a fiver at £4.99. It does make me laugh though! And when I walked into My Other Half’s office wearing this he started smiling as well! However, I do know that I wouldn’t wear those two dresses for, say a day in town or up to London. The skirt below is far more suitable. Btw, unusually for me, the skirt wasn’t a charity shop bargain as I bought it (reduced, mind you) from Jacynth of the-Bias-Cut.com in a pop-up shop in Brighton last year. Jacynth’s clothing company also works to counter ageism in fashion and good for her! The skirt is incredibly colourful and glitters as it catches the light. If I have any advice and I don’t really like the idea of me giving advice, but if I did, it would be move away from black and wear colourful clothes. Here’s the coat I’ll be wearing over the skirt. As it’s cold I shall wear a hat with this outfit. Both are charity shopped. The coat is beautifully cut, has an M&S label, and cost £15.00 exactly, and the hat was £5. Have you noticed I haven’t put up anything on YouTube for a bit? Two things: I think it’s quite good to get off that helter-skelter of rushing to a social media deadline – mine is a slow channel that will focus on quality of content rather than quantity. But actually I couldn’t do any filming as I had a bit of a virus, it was absolutely nothing serious, but I couldn’t wear my contacts or eye makeup, which was a bit of a bother, to me! Anyway, thank you for looking at the videos – click on the icon to see them. That’s all for now – and thank you to all the visitors who became followers. As I said you are so welcome and like all my followers and commenters you are very much appreciated. Gorgeous coat, and it hangs beautifully on you as you’re so slim. I’m often tempted by wool coats but I have limited cupboard space so always end up with something rainproof and hooded (and boring) as I hate carrying an umbrella and always end up leaving it somewhere when I do. Thanks Umi! Re: Cupboards – there were no wardrobes whatsoever in our flat so we remedied that. They were the first things we put in! Wool coats (but not synthetic) are very good in rain. 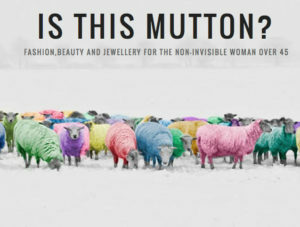 If you come across a wool coat in a charity shop – pounce! I know about losing umbrellas – just replaced a lost umbrella as it’s a week of rain, I think. I do so agree , we should wear what makes our heart sing, regardless of age. Those age appropriate articles really do annoy the heck out of me. I did see you in that post, an example that age or budget shouldn,t hinder your style self expression. Lucky you having excellent thrift shops, ours are full of tat. That coat is a winner, almost vintage in style. Those little dresses are cute and yes with your slender legs you can carry them off. Such a shame about your thrift shops – when I hear that I think they’re missing a trick as good thrift shops in the UK are busy places with lots of customers! And those articles really annoy me, as do those lists of ages that end 65+ or worse 65++++ as I think that the latter is about addressing the 70s and 80s person but not actually saying so – grrrr! The coat is great – hats used to be my weakness but now it’s coats! You are brilliant,brave..and it all works. Love the coat. I had one very similar many years ago and regret parting with it. It would have been a design classic! Ho hum. I’ll just enjoy seeing you look fab in yours. I had one too, but got rid of it, actually the cut would now be a bit old-fashioned. But camel coats are classics and they do turn up in charity shops a lot – this one was beautifully cut, so I pounced on it! Yes, like you, I do think some clothes should lift the spirits. I will wear those two, but I’ll treat both as tunics and wear with jeans and/or thick leggings. Love that first dress, Penny, and so appropriate that it came from the Cats Protection League! Does it purr when you put it on?! Or maybe you do! I sympathise with Jill. The charity shops round my neck o’ the woods are also full of tat – mostly. I have enjoyed the occasional bargain so shouldn’t whinge really, but the day I find anything by Zara and suchlike around here you’ll hear my gasp of delight- and disbelief – in Brighton! You certainly live in the right area, my girl! Hi Zepherine, and what a shame about the charity shops in your area, because nowadays a lot of charity shops get their clothes shipped in from elsewhere. I always think, if they’re run well and get the right clothes in they’ll get the customers. But you’re right some areas are truly good, and not necessarily Brighton, btw, in my area Lewes and Seaford are great. So is Worthing, Bexhill (so many charity shops) and although I never seem to go there Eastbourne too. Actually Penny I really like the first dress. With good black leggings/jeggings I think it looks modern, comfortable, and you look very good in it. Well done on your other ‘finds’ too. I rarely find anything I would want to buy in charity shops – maybe I don’t look hard enough! Hi Julie. Yes, see above in my answers to two other commenters, there are areas and areas for good charity shops, but most times I walk out with nothing, as one should, as people are right, there can be a lot of tat. Thing is to always look for that one bargain that is also of high quality! Looking great as usual! You have such long slim legs you can wear a mini which my fat knees would not allow. I like the colours in the long skirt are lovely and glittery is a bonus. The coat is lovely too. I’ve got a black and white herringbone fitted coat with a long full skirt which I can’t throw away until I find something similar and better quality. Have you noticed how winter coats are now largely made from synthetics? Easier to care for and not prone to moth attacks I suppose. I’ve often had compliments on what I wear and I think it’s mostly down to lots of colour; how I hate ‘greyed’ pastels, they do nothing for me anyway. I rarely buy anything in local charity shops which is odd as I live in an affluent area. Clothes are much more worn than they used to be and the fabrics are cheap but not cheerful. Where my sister lives is a lot better. As you know I get lots of bargains on E-bay. Of course postage is a consideration but I recently bought two dress, one M&S for £12 including the postage! Also just bought a Precis Petite dress and cardi which must have cost over £100 for a total of £17.50. The main thing is to ask for measurements before you bid, unless you are sure you know the brand. I’ve found M&S very unreliable for size. Some traders allow returns at your own expense but they refund your original postage as well. Yes, I’ve made a few mistakes but if the item was very cheap or the seller does not take returns I just pass these on to the charity shops. Thank you Lynda, yes your thing is E-bay and mine charity shops, and the time you spend on E-bay must be equivalent to me hunting through charity shops. In my area I don’t find a lot of worn clothes and the quality items are there – amongst the old-fashioned and really unsuitable clothing! Looks wonderful! I am a charity shopper too! I like both of those dresses but I see what you mean about the skater skirt, probably not appropriate for the city. The long skirt and coat however are fabulous, I would love them. I’m going to endeavour to find long skirts for next winter if not this, I’m far too cold in the long tunics that I have at the moment, I keep regretting skirts that I’ve discarded in the past! It’s just a bit tricky when you’re small, a very fine line between smart and frumpy. Glad you’ve recovered from your virus, keep warm. Hi Chrissie – yes mostly gone, that virus, it’s just the time of the year for them. Skirts are great but I get what you say about being small, so tunics are good for you. It’s either look for the right skirts of the right length or thermal tights and leggings! Actually just bought a thermal top – amazing warmth and nice too. Love, love, love the coat! I do love your attitude towards aging and ageism. When did everyone become so judgemental about other people’s appearance? I love the first dress and that coat is divine; the cut is stunning. With the addition of the scarf and béret, you definitely have a certain ‘je ne sais quoi’! Yes,,I really don’t like any of those articles about what you should and shouldn’t wear – because it’s entirely about body shape, height, tone of skin and so on – age really shouldn’t come into it!!! I did think with the side-on beret should I be saying, ‘will I wear it zis way, or zat way? !’ And OMG isn’t predictive spelling so annoying – it’s taken several goes to get to zis! I couldn’t agree more Penny!!! First on the aging and clothing thing, and second on the second hand pieces. Oh, and third on the color. Not that black is awful on everyone, but what’s wrong with bright and fun colors. I have to tell you that skater’s dress is just the best thing ever. It is fun. And perfect for any fun day!! Don’t we all need more fun days in our life?? I think the best thing I did was give up on the idea of the “right” things to wear. Except maybe at a funeral. But otherwise, having fun with clothes just makes my day. The skater skirt is my favourite!!!! And thank you so much Jodie – all better, but it was 2 weeks of feeling absolutely so tired – all gone now!!! The coat was an amazing find – and thank you about the legs – actually the shape at the top of the leg has improved with Pilates! I really like the first dress, so lucky to be tall and slim. I bought a M&S long navy coat in our charity shop for £3. also a brown Windsmore coat for £7 whilst on holiday in Norfolk. Charity shops have some really good coats – there’s absolutely no need to spend a fortune in the High Street, I think! Glad you’re feeling better. I’m looking forward to the next one. I’ve taken up wearing eye shadow again as a result of the watching the videos. I do wear eye shadow every so often then stop but I’m enjoying wearing it again at the moment! I will definitely treat these dresses as tunics. The coat is just such a good find as a lot of camel coats have that extra bit of material on the back, which is kind of old-fashioned and probably why they’re in a charity shop! This one was just cut to swing as you walk – a lucky find! Thank you! I love the beret too! I have tried numerous times to check the You Look Fabulous site but there is no way I get in, even not on another browser. I actually like the first dress on you! And of course the coat and the hat which looks fabulous. I will be in Rye the last week of February and want to go shopping in Lewes again. Can you recommend a shop? Thanks so much Lynda – been out all day! Hi Nancy – did you see Lynda’s reply to you? 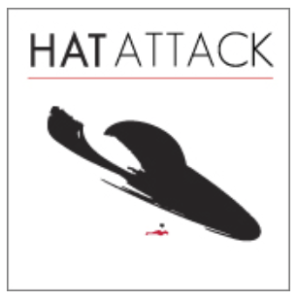 Was out all day but I did manage to check the icon on this blog and it is working. Actually since GDPR last year there are some websites and blogs that just don’t let me in – such a blithering bother. I find Blogger/Blogspot sites the worst. Let us know if you can get in to Look Fabulous Forever’s site. This is so inspiring! I love a good charity shop and you have found yourself some brilliant items! I totally love charity shop shopping, which is fortunate as I really can’t afford the High Street prices! The bargains and the quality items are there though – thanks for commenting. I specially like the first dress on you….lovely slim legs like that deserve a showing! Gorgeous coat too. 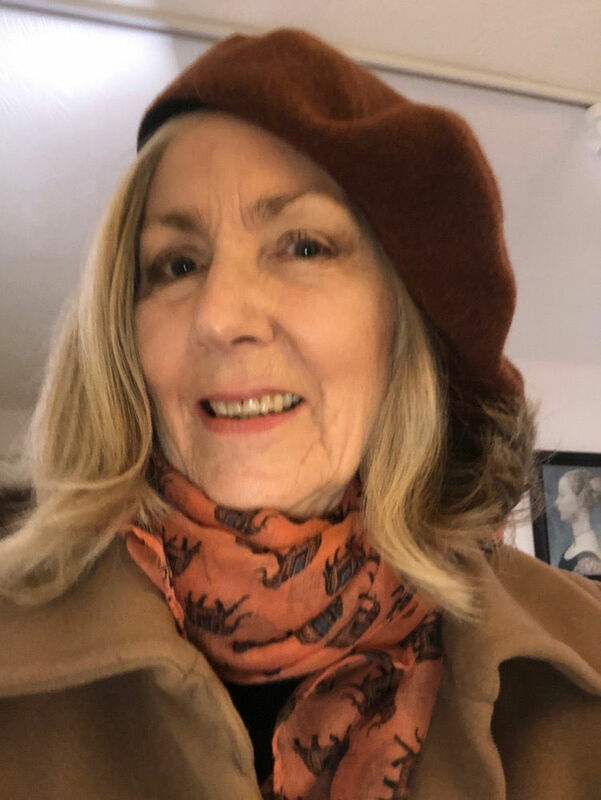 Thank you Eloise, the coat is amazing and is very suitable for London – it was used last Friday and coped very well with a lot of rain and wind. When I first looked at this post, I thought: silly me! I had thought that Penny had said unsuitable dresses. Chuckle. I like them. Very feline. Thanks so much! Everyone seems to like the first dress but I actually prefer the second!! Penny, you give me such hope. Love your thumbs up to society with those mini dresses. you certainly have the legs for them. Jealous, moi. 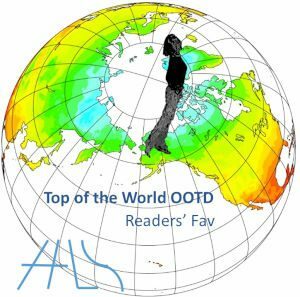 Thanks for linking and do join again tomorrow. Thanks for the comment on the legs – actually think Pilates has improved the top half! And thank you for hosting! Will be coming onto yours mid-week as all my energy has gone on to another catchup on that B word on My Other Blog…. what a situation and a half! Penny…I’ve so enjoyed getting to know you more through your blog. 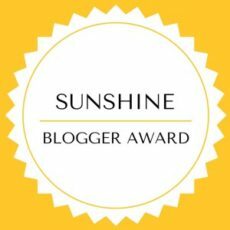 So I nominated you for the Sunshine Blogger award. The details are on my blog today, and I hope you’ll join in. I’d love to hear your answers in the future!! 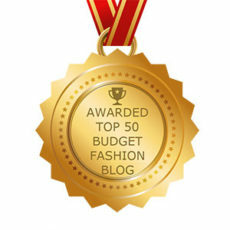 Just read your latest post all about you and the Sunshine Blogger award – oh wow! How awesome – I shall answer all those questions and nominate some new people 🙂 How lovely. Will do this over the w/e and post on Monday/Tuesday – have a simply great weekend!